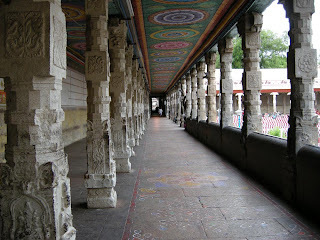 The Meenakshi Amman Temple- The majestic entrance. Someone said that due to some accident or something the buses in the route are being delayed. A collective groan rang out from all of us waiting for the bus. A possibly long night. Or may be the start of a long morning. The clock had just stuck two. Tired and exhausted to the bones, I watched as a cold winter morning, with damp drifting winds complete; soaking my already sweat drenched shirt. Drifting in and out of the grey regions of slumber, I looked around. Being a busy route, in no time there was quite a crowd waiting for the bus. People wanting to get to their homes to their loved ones; every one lost in their own version of life; Strings of thoughts throwing multiple shadows in the crevices of their own urgency and need. Just like a heap of gooseberries poured from a sack, a myriad of people sat around scattered with their eyes expectantly looking out at the entrance of the bus stand. Almost four hours of waiting was starting to get to everyone. A few mothers were trying to calm their children, pulling the red worn out muffler over their exposed ears; a couple of old men more wrinkled than the quilts that they dug into with their skinny hands blue veins protruding, laid low huddled together; a group of farmers tried to best the chill and the wait chewing their pan squatted around talking among themselves. A handful of working men restless, probably returning home for the week end were heatedly engaged in critiquing the transport system. And of course a few lost souls like me were passing time by watching the entire milieu unfold. Every bus that came into the bus stand was rushed into by us, only sadly to realize that not even one of them were en route to our destination. Just then, a bus slowly moved out of the bus stand, the dull lights of its interior painting up the destination board that read – Madurai. My eyes popped out. The bus was almost half empty and my legs were yearning to take a rest. On an impulse, I got on the bus. Of course I wanted to get a bit of shut eye in those warm inviting seats but most of all, I was simply giving in to my sudden urge to visit Meenakshi Amman temple of Madurai. A place that I last visited almost 10 years ago, when I was in my 6th standard. Memories of the school excursion flooded my half awake senses. Nostalgia closed in. My school friends, the unforgettable bus trip, the dance that we did as we stepped into each other’s legs while travelling in the bus, a piece of laughter that was shared, a trip that was cherished and remembered almost a decade ago, a child’s memory with it’s own nuances and sauces; I fell asleep. The earth was slowly warming up to the kiss of the sun’s early morning light and the birds were making a delightful ruckus in the trees around the temple. A few peddlers selling flowers and incense to the devotes who have arrived early to avoid the rush, A old lady was busy sweeping the yard in front of the road side stalls, someone was decorating the front of the temple with a rangoli, a couple of foreigners were asking for directions from locals, the air was warm and inviting. 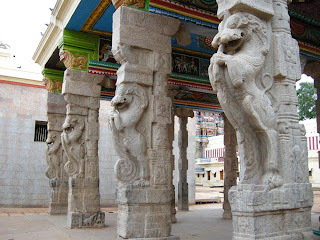 A good day to have come to visit the temple, I thought to myself as I looked around standing at the entrance of temple. 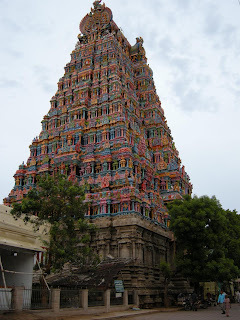 It’s Gopuram (Temple Tower) as majestic as ever stood above the environs basking the glory of its own regality. I walked inside the temple drinking in the serenity. The temple was almost empty and in its void, I felt perfectly peaceful. After all you don’t need to be a theist to feel the aura of a temple; you just need to listen. After spending a while, taking in the freshness of the atmosphere, I started to wander about lost with the purpose of being lost. 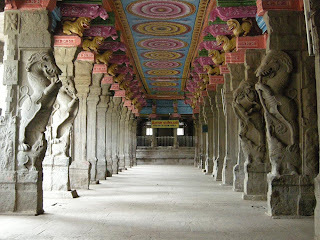 The perfect symmetry of stone pillars, the exquisitely engraved statues, the walls with tepid stories painted with vivid colors untainted, Stone gargoyles with fangs menacing leaping out at the edges of the walls, spacious corridors well laid, ceilings brush stroked with beautiful geometric patterns, the Thirukkural (Tamil poems) that have survived the passing of time etched into marble walls, the temple towers purple and mighty with their brows looking at the sky; The entire place is a standing testimony to the brilliance of the architecture of the Dravidian*(ie the Tamil) culture. I took a deep breath and felt glad that I responded to my impulse and took the trip; a worthwhile expedition to put my camera to good use. A temple is a whole new level of stage where people act out their religion. Sometimes stern faith, sometimes even absurd faith – instilled by blood. People were busy praying, completely involved in their poojas, trying to catch a glimpse of the holy deity, sitting around eating prasadham (blessed food), some singing hymns in praise of the lord, everyone in their own way practicing religion just they way their parents and their parents before them would have done, no questions asked. A local was explaining to a curious foreigner – the culture of the south as he saw it- the customs, practices and the religion. After standing around listening to him for a few minutes, I found myself trying to wrestle with a few questions. Is our culture defined by our religious practices, the customs of matrimony and other such practices we surround ourselves with? Is it our language? The way we express ourselves – the phonetic finesse of our evolution. 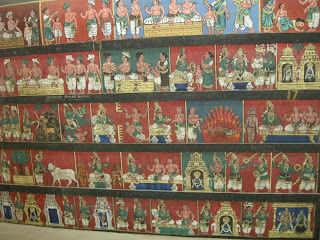 Is it the way we relate ourselves to our caste and to our own creed? Is it a collective dictum of India as a nation? The word culture has been interpreted in a million ways or may be even more- After all, political parties keep at it everyday- bringing in new meaning to the word itself. I stopped wandering and sat down. My mind alone still lost with a purpose, searching for an answer. I gave out an involuntary sigh. The more I sought for a clear definition, the more ifs and maybes cropped up. 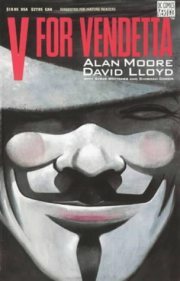 The vaguer, my own idea of culture became. May be- Culture, though defined as a collective prerogative of a group of people, its outlook with regard to every specific individual has to be decided by that individual itself. May be- It is in the “variety of interpretation of culture with regard to passing time” - the evolution of the social and the political society of tomorrow depends on. May be- Culture is in taking pride in what we are, rather than in politicking what we are. May be- Culture is about accepting people for what they are with their short comings, tears and laughs. 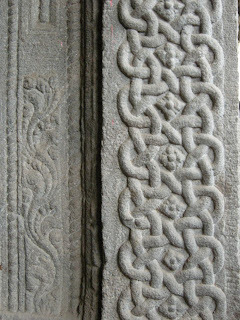 May be- Culture is what that makes us believe that we are one as a society, a human civilization. Too many answers..... Nothing specific.... But everything related and bonded with each other- moving in cohesion with the chaos of humanity. Sitting amidst alternating dance of shadows in the the Thousand pillar hall, I finally seemed to have realized the source of it all. The pride of what we are. What our forefathers have achieved. Our sync as a civilization. Every one wants others to know and acknowledge, the richness of their own past, of what they have achieved and the potential they hold within themselves. That's why, people get ruffled when talked about culture. After all, blood is thicker than water. Doesn't real plume, pomp and pride shows off without any effort.? Just like the way, the great temple of Meenakshi Amman has astounded me, putting me in touch with the architectural culture of my forefathers. Just like the way India stand as a edifice of meditation, yoga and spiritual without anyone advertising it? Like the way, every time- you hear an exquisite poem in your native language, you get your blood pumped up and your heart revved up. You can feel the beauty of the words, blooming with the poem. Nor I have the need to barter it. Nor do I am too insecure, to protect. I am content just to take pride in my culture of what I am -- a lineage of people who strive to be themselves, establishing exquisiteness in things they work towards, thereby leaving a piece of themselves behind for the future generations to take pride in. I see the temple as a standing testimony to that. Ha... Ha... May be even my blog is a part of me. Something I leave behind. A part of my culture, challenging you to think for yourself. To believe in yourself. To push and break your own boundaries. I visited Meenakshi Amman temple a few months back and this post was written with the frame of mind, I had during that visit. The post goes along my own flow of thought process and impulses. The snaps that I have posted were taken with a Nikkon Coolpix- P5100. I have reduced the resolution, for easy uploading. Very insightful post.. and many of us have same questions in mind already.. :) Snaps are spell bounding.. amazing.. so you are a good photographer too Eh??? SOoper ya..
Am glad you enjoyed the snaps..
yes i m in love with it! all in all! Hey, your new DP is awesome.. 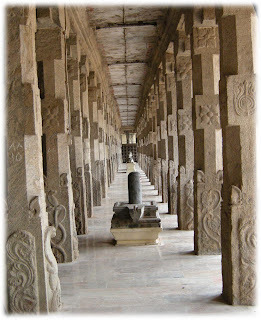 I have been to Meenakshi Amman Temple and its awesome...would love to visit again if I get a chance. After all, we have to search for our answers... don't you think so??? Thank you.. :D -- you have just put a smile on my face..